Tube end forming machines or swagging machines can be designed and developed as per the customers' specific requirements. Santec's tube end forming machines are able to adjust various OD and wall thickness specifications of various tubes and pipes from different ferrous and non-ferrous metal/alloy. Swagging machines can be designed to any level of sophistication right from the simple machines to multi-purpose system. The flexibility can be further increased through additional capabilities for reducing set-up time. 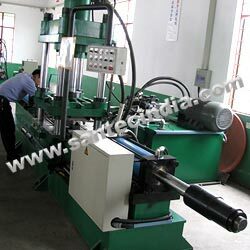 Snatec's tube end forming machines or swagging machines are designed for multitude operations. Santec's swagging machines are controlled through various ways from basic relays to sophisticated PLC control.